The Site allows you to post content and shop online. However, you are prohibited to do the following acts, to wit: (a) use our sites, including its services and or tools if you are not able to form legally binding contracts, are under the age of 18, or are temporarily or indefinitely suspended from using our sites, services, or tools (b) collecting information about users’ personal information; (c) post false, inaccurate, misleading, defamatory, or libelous content. Members on this social networking website are prohibited to use the services of the website in connection with any commercial endeavors or ventures. This includes providing links to other websites, whether deemed competitive to this website or not. 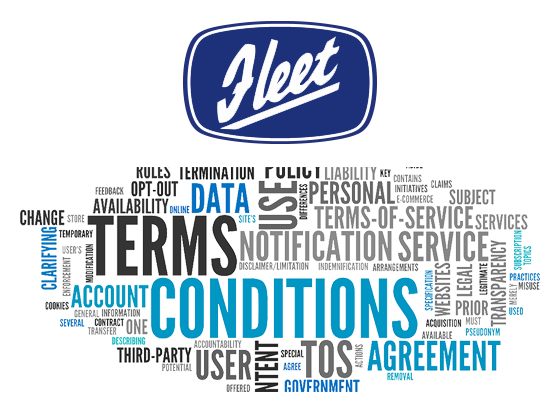 Juridical persons or entities including but not limited to organizations, companies, and/or businesses may not become Members of Fleet (line markers) Ltd and should not use the site for any purpose. Illegal and/or unauthorized uses of the Services, including unauthorized framing of or linking to the Sites will be investigated, and appropriate legal action may be taken. Some links, however, are welcome to the site and you are allowed to establish hyperlink to appropriate part within the site provided that: (i) you post your link only within the wiki or message board section; (ii) you do not remove or obscure any advertisements, copyright notices or other notices on the site; (iii) the link does not state or imply any sponsorship or endorsement of your site and (iv) you immediately stop providing any links to the site on written notice from us. However, you must check the copyright notice on the homepage to which you wish to link to make sure that one of our content providers does not have its own policies regarding direct links to their content on our sites. You agree not to disclose information you obtain from us and or from our clients, advertisers, suppliers and forum members. All information submitted to by an end-user customer pursuant to a Program is proprietary information of Fleet (line markers) Ltd. Such customer information is confidential and may not be disclosed. Publisher agrees not to reproduce, disseminate, sell, distribute or commercially exploit any such proprietary information in any manner. Failure of the Fleet (line markers) Ltd to insist upon strict performance of any of the terms, conditions and covenants hereof shall not be deemed a relinquishment or waiver of any rights or remedy that the we may have, nor shall it be construed as a waiver of any subsequent breach of the terms, conditions or covenants hereof, which terms, conditions and covenants shall continue to be in full force and effect. This Agreement shall be governed by and construed in accordance with the substantive laws of Worcestershire, without any reference to conflict-of-laws principles. The Agreement describes and encompasses the entire agreement between us and you, and supersedes all prior or contemporaneous agreements, representations, warranties and understandings with respect to the Site, the contents and materials provided by or through the Site, and the subject matter of this Agreement. Any dispute, controversy or difference which may arise between the parties out of, in relation to or in connection with this Agreement is hereby irrevocably submitted to the exclusive jurisdiction of the courts of Worcestershire, to the exclusion of any other courts without giving effect to its conflict of laws provisions or your actual state or country of residence.